We make every party one to remember. From Nightclubs to Luxury Transportation, we can help! Las Vegas offers so many entertainment options, but which ones will you enjoy the most? How do you know if you got a good deal? We help our clients get the most value for their dollar at the top nightclubs & dayclubs in Las Vegas. Couple that with our Luxury Party Bus service for the ultimate Las Vegas experience! Enjoy all the VIP amenities Las Vegas has to offer without breaking the bank. Just call us to unlock unmatched access & pricing at the top venues in town. Visit multiple Las Vegas nightclubs for one low price. VIP Party bus transportation included! Full VIP nightclub experience. Front of line admission, VIP table inside the club, bottle service, and unlimited mixers. The ultimate Vegas nightclub package! 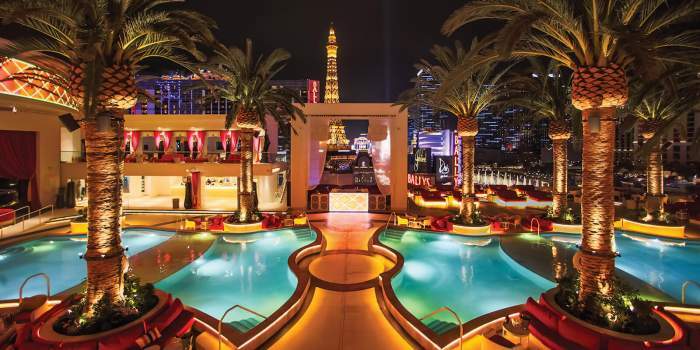 Soak up the sun at two of the hottest day clubs in Las Vegas. Party bus transportation and drinks specials included. Arrive in style no matter the occasions. We have a huge fleet with vehicles large enough to accommodate up to 40 people. Enjoy open bar and AYCE tapas at Firefly. Great for large parties! Raj was amazing. We got a great deal and table! Met so many girls because we were right next to the DJ booth! OMG this was so much fun! Me and my girlfriends had the best time. Our host was so fun (and cute!) he showed us all the fun things we would have missed. 5 stars! What a night! My only advice is spend the money on table service. It’s worth every penny! I couldn't believe how affordable it was! We seriously thought there had to be some "catch" or surprise charges. Glad we were wrong. What a night! Thanks guys!